This month was the month we went on holiday! I got some great mummy and me pics! Was a really nice week and got to do loads of different things with lily which made good photographs. Here are some of my favourites. You can also see how happy I am here in my favourite place. Weymouth. 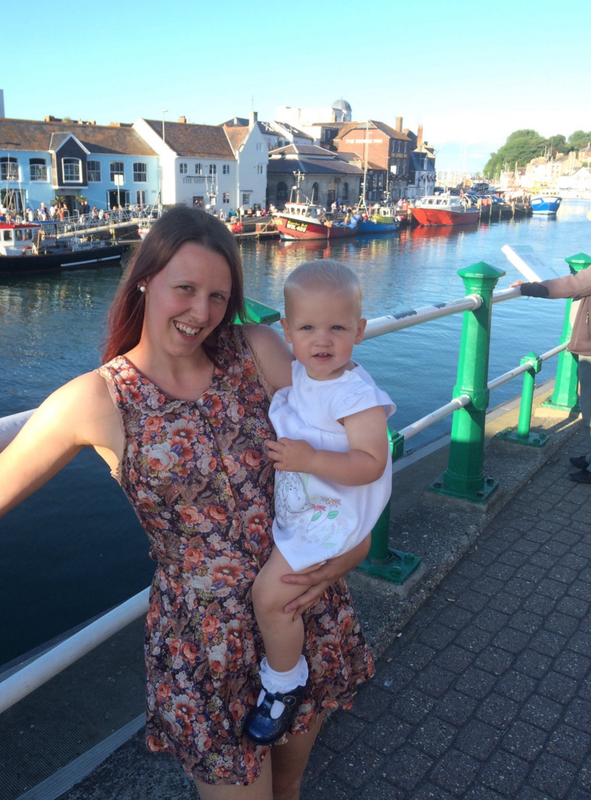 Last week while on Holiday in Weymouth, Dorset. We went to Monkey World for the day. Monkey World has always been a place close to my heart and Ive been visiting ever since I was a little girl when my parents would take me. 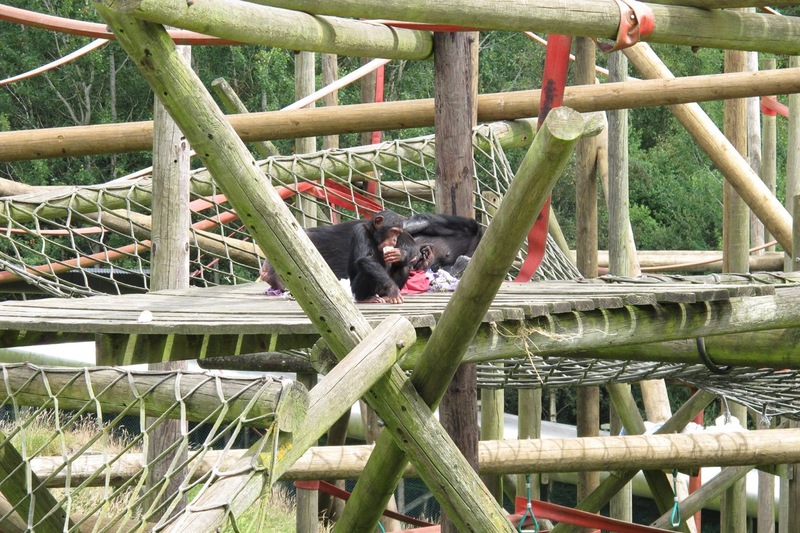 Monkey world is a ape rescue centre that was first set up by Jim Cronin in 1987. His aim was to rescue chimps that were being used on spanish beaches as photographer props and provide them with a stable real home. Little did he know at the time that his plans would be successful and years later he would be taking in monkeys of all types into the park. 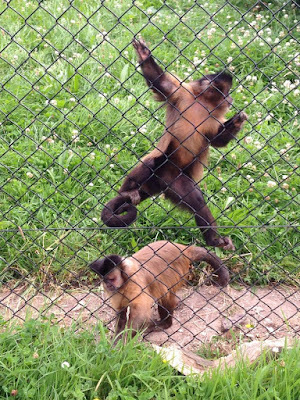 Monkey world now has 65 acres of land which is now home to 250 primates. The monkeys all live in an environment that is just like there homes would be in the wild. Most of the primates at the park have all been rescued either from the beaches, labs, or the illegal pet trade. A lot all have very sad stories and Monkey World works to rehabilitate and give the monkey the best natural life that is possible for them. There are a few primates born at monkey world but monkey world have a birth control programme to keep the numbers of monkeys born to a minimum leaving space for more to be rescued. 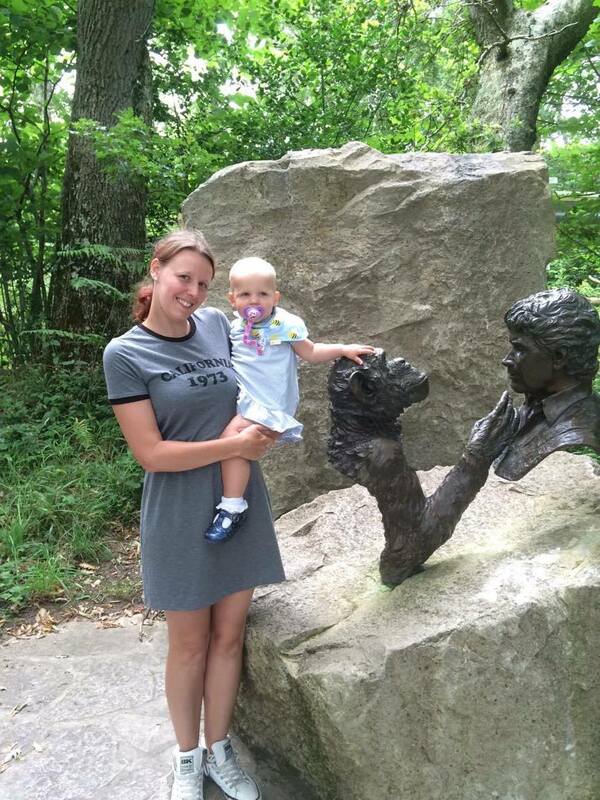 One of the reasons I always visit the park is that they reply on visitors coming to be able support the funding of the park and the continued work to rescue more primates. Over the years of visiting I've seen new enclosures built and new monkeys arrive and so its great to know that with support monkey world can save more monkey's lives. So let me tell you a little about our visit there. 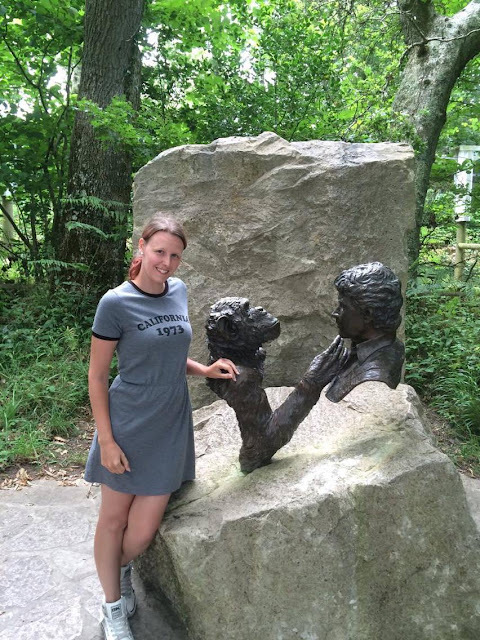 Our first stop was to visit the chimps they have at the park. Over the years I've grown to know some of the chimps there and can name a few without even looking them up. 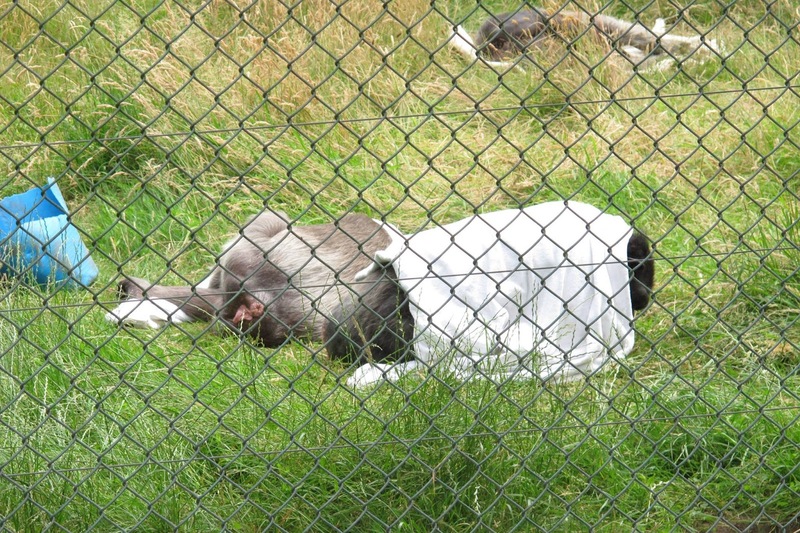 You have Paddy, who is one of the biggest with a silver back and he is the leader of a group at monkey world. He is always easy to spot when you know who you are looking for. Then you have Butch who is the leader of another group called the bachelor group. Both of these monkeys were used as photographer props. A lot of the chimps were rescued from being a prop and people don't think much of it to begin with as its seems that the monkeys are happily posing for a photograph but most the time what you don't see is the ill treatment the chimps get and are often kept in terrible living conditions and cages. Its always so nice to see the chimps now though in monkey world. Acting like a normal chimp and living in such nice surroundings. I must mention one of my favourite chimps. Trudy. Originally Alice. She was rescued from a circus and when she was first brought to monkey world she would walk around cuddling a big bundle of hay. I find it hard to make out which chimp she is now when I look at the group. But that just shows how rehabilitated she now is. She is part of Hananya's group. Then we have Sally, who also holds a special place in my heart. She is adoptive mum to many baby chimps who are either born at monkey world and rejected by the birth mother or arrive and need looking after. Sally has a heart of gold and takes them all in as if they were her own children. On the day of the visit a lot of the chimps were relaxing in the sun, some wrapped in blankets and a few of them could be seen with ice lollies that the park would have made up for them out of fruit. 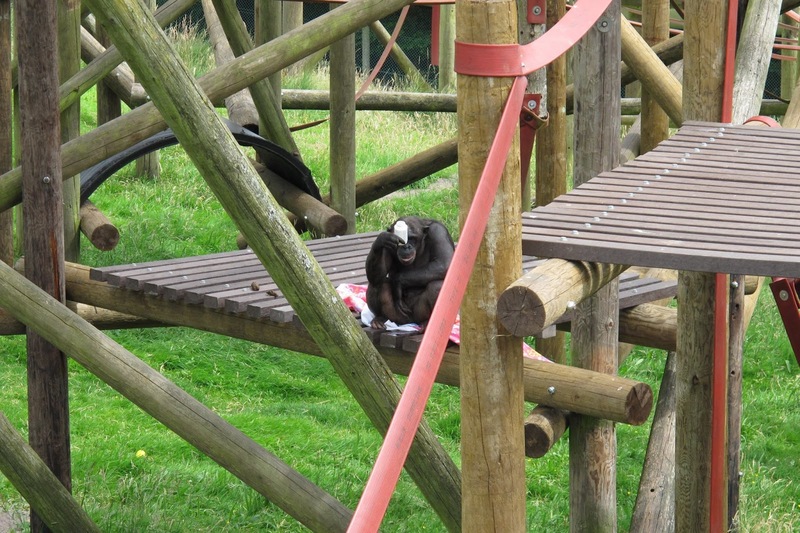 Here are a few of the photographs of the chimps I took at monkey world. As I said above, its not just Chimps at the park. The park is home to a lot more different species. There are Gibbons, Capuchin Monkeys, Spider Monkeys, Wooly Monkeys, and many more. There are also Ring-Tailed Lemurs and they have a open enclosure that you can walk around. All the little tiny monkeys that are at monkey world have lots of different enclosures that all lead to one and other with little bridged tunnels that go across the paths that we walk along and you can see the monkeys all running along. A lot of the tiny monkeys were mostly rescued from either labs or the pet trade. A lot of people think they are great as pets but in reality they need a lot of space and shouldn't be kept in a small cage. 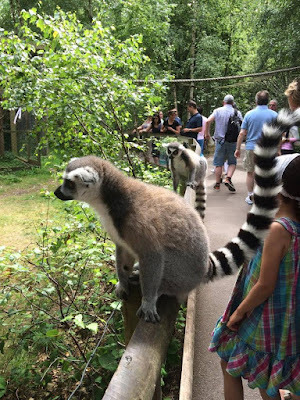 One of my favourite parts of monkey world is the Ring-Tailed Lemurs who have a open enclosure that we can walk around. The enclosure is managed by staff and we aren't aloud to touch the lemurs but its great to get up close with these animals and see them. 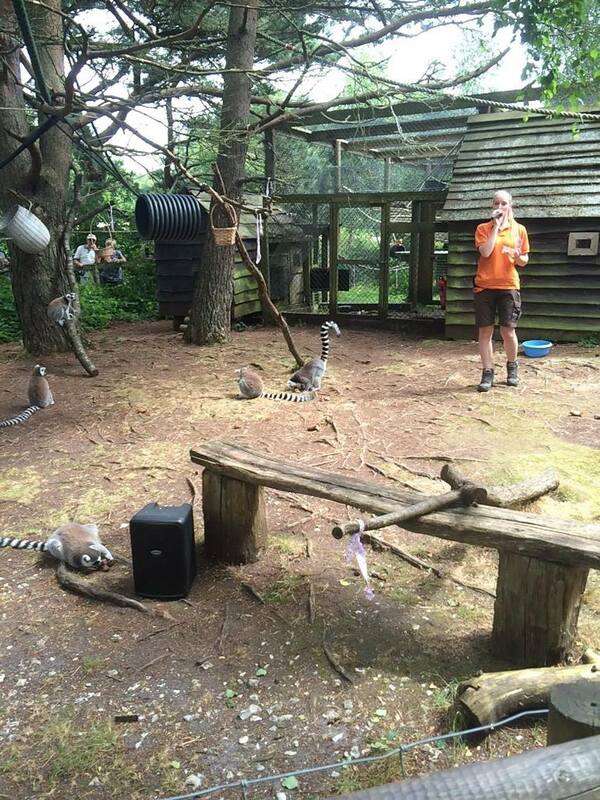 I viewed one of the talks about the lemurs while we was there and its great to know that its the women lemurs that are the dominant ones. As we watched the lemurs get fed some frozen bananas they kept jumping onto the fences close by us. Then last but not least we went to see who I had been most looking forward to seeing. The Orang-utans. The group I was most excited to see was Gordon's group. Seeing Gordon is special to me as I've been visiting monkey world so much that I've seen him grow up. 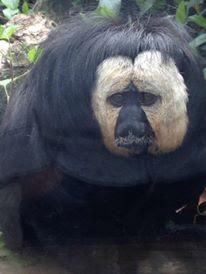 He was born at the park in 1997 and I remember seeing him when he was a tiny baby ape that very year. 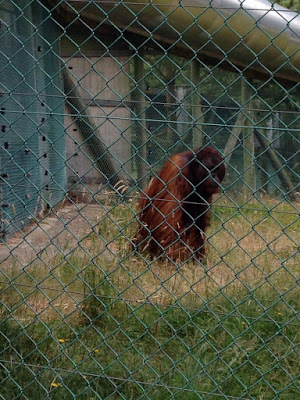 His mother is Amy and she was one of the first Orang-utans to come to Monkey World. Gordon is now 18 years old which means I was around 11 when I first saw him and wow has he grown! He was quite happy to show himself off at the park too as he walked across the ropes and a few times did it with no hands! Very impressive. I had to grab one last photograph while at the park and that was of the memorial of Jim Cronin who set up the park and Charlie who was a very popular chimp and loved very much by Jim and the other staff at monkey world. Both sadly have passed away but there is this beautiful memorial placed here at monkey world and they both will never be forgotten. 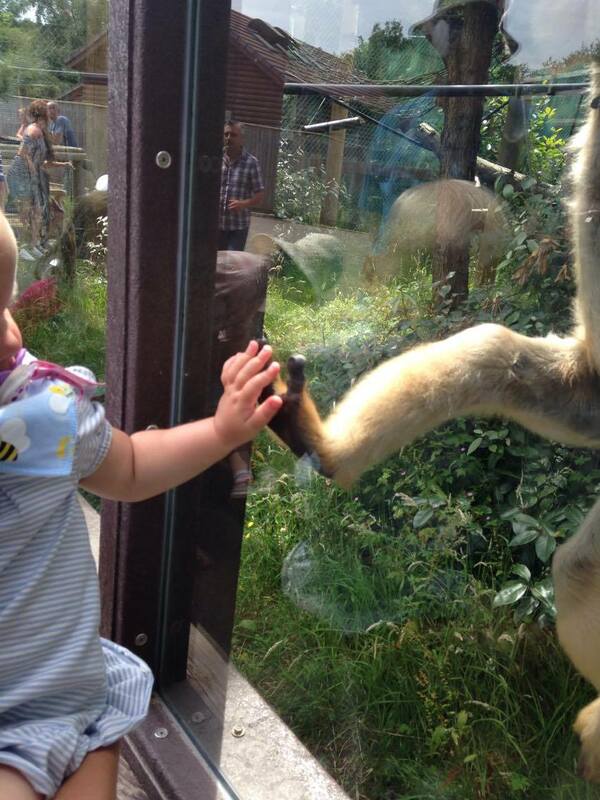 Overall the day at monkey world is a really great day out. As well as getting to see the brilliant animals and getting to listen to the fabulous talks all about them there is also a amazing adventure park right at the end that your own little monkeys can go and climb on. I really hope that if you haven't been before, then you consider taking a trip there. 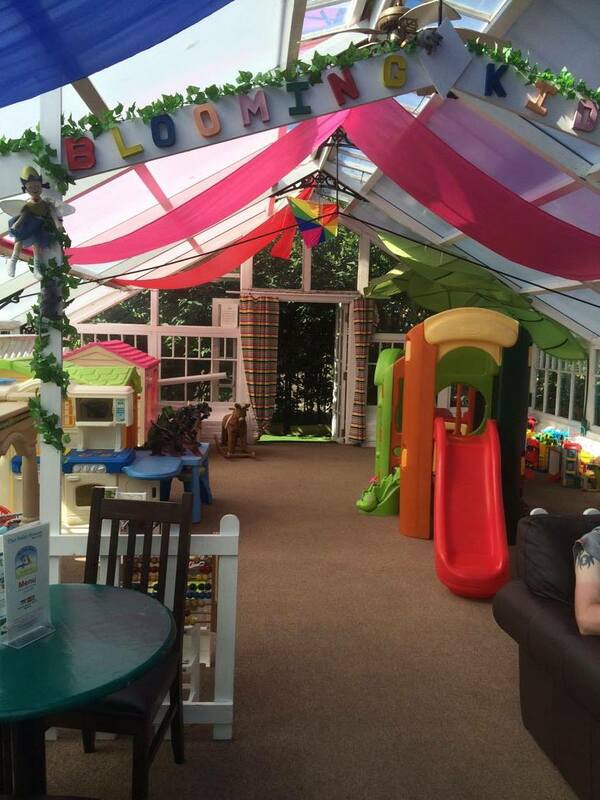 Not only is it worth it for a fun day out, but you will also be helping support monkey world and all the great things that it does for the monkeys. The park is only £11.75 for a Adult ticket and £7.50 for a child aged 3-15 years old. There are also family tickets available. The park is open every day except christmas day from 10am - 5pm, extending to 6pm in July and August. There are also other ways you can help Monkey World. One is the adopt a monkey scheme. No this doesn't mean you can take a monkey home with you. That defeats the point. But you get to choose a monkey and get a certificate saying you have adopted them along with a photograph. You also get sent the newsletter magazine sent out 3 times and year and FREE admission to the park for the year. For Adults it costs £35 and for a Child £25. The money goes 100% into a fund that is solely used for rescue and rehabilitation of the primates. This is something that I will be doing soon. Then there is also your own fundraising that you can do, and also the Jim Cronin Memorial Fund which you can read more about here. 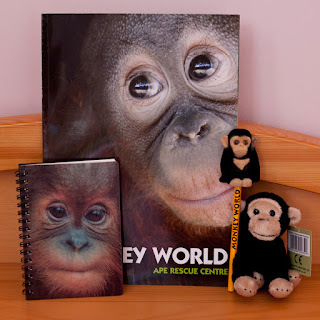 As I am all for helping Monkey World, I took a trip to the gift shop where the money made in there also goes to help the monkeys and I bought this little goodie bag of items and brought it home especially for my readers. I would love you to help me spread the world of monkey world and enter for a chance to win these goodies. Well we are back from our holiday. The weather was amazing, and we had a great time so I thought I would write about a few daily highlights. We arrived at 11am on the saturday morning, sun was shinning and we were very happy to arrive. 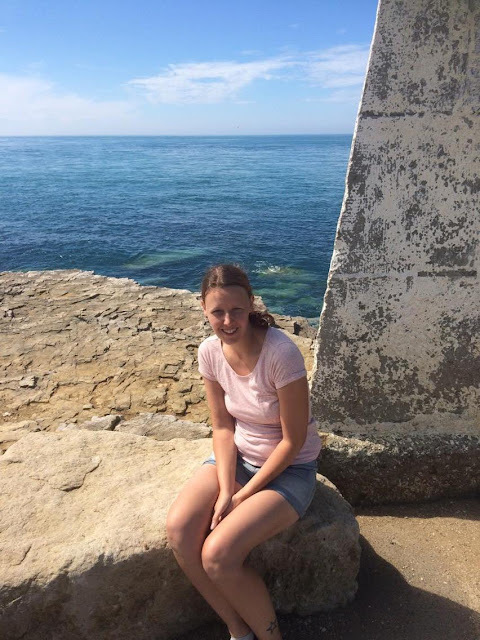 Saturday is usually very much of a chilling and settling in day which consists of walking around in the beautiful Northe gardens, going for cups of tea and settling into our holiday flat on the harbour. Lily was really happy to see her Nan and Grandad and wanted to go to my mum straight away. We finished the afternoon by heading to a park so Lily could go on the swings while everyone else unpacked. My dad came along so it was really nice for Lily to have some bonding time with her Grandad. 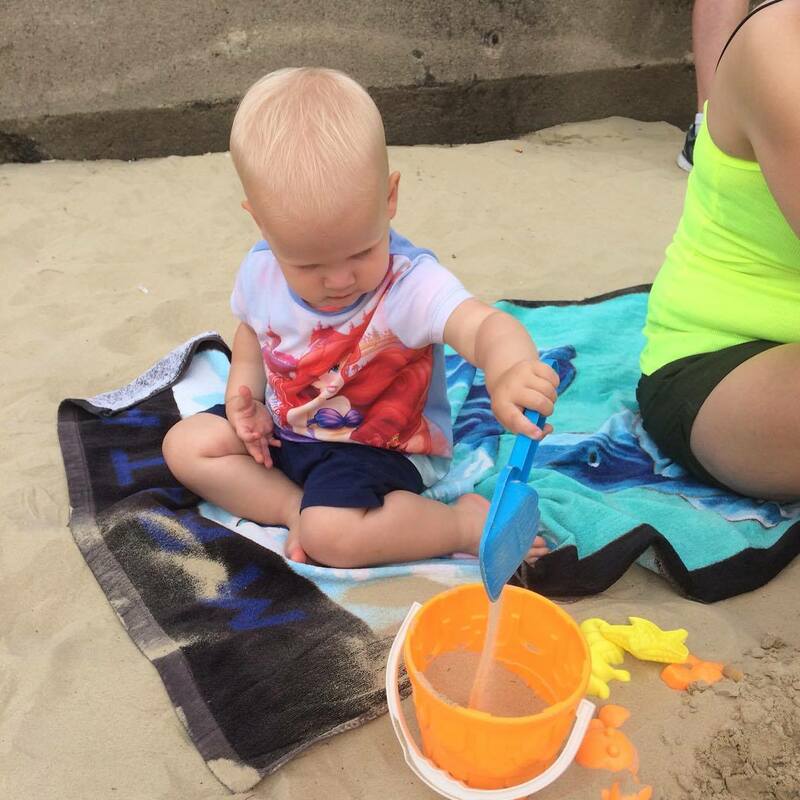 Sundays highlight was that we headed to the beach for the morning. 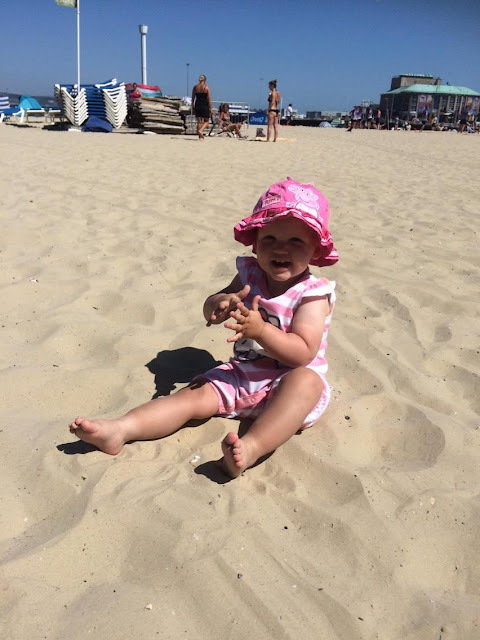 Lily was a little fussy with the dry sand and didn't really like getting her feet in it and mostly sat on the beach towel digging. 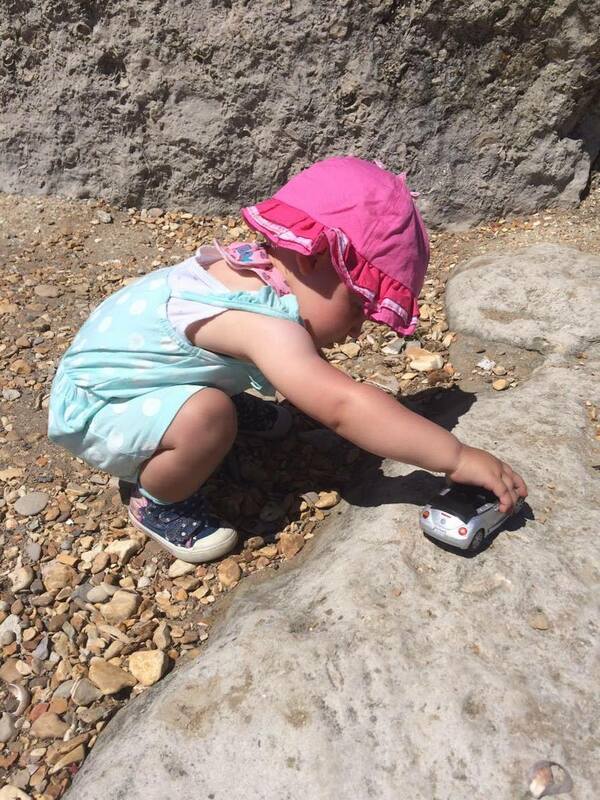 When I put her little beach shoes on she was off walking around on it though collecting shells in her bucket. 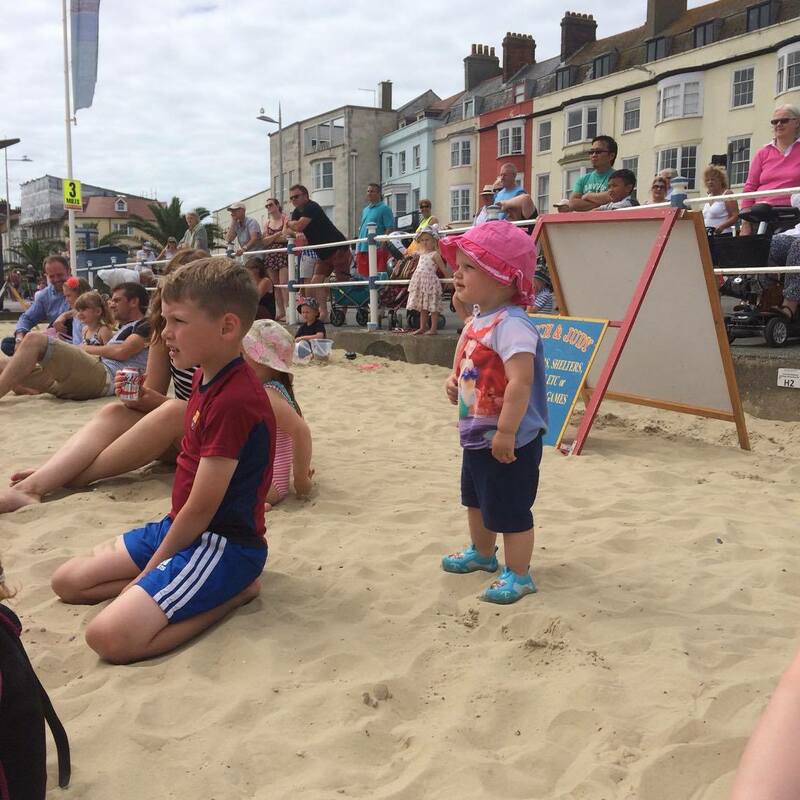 We then paid for Lily to watch Punch and Judy on the beach which is something I always loved doing as a child. 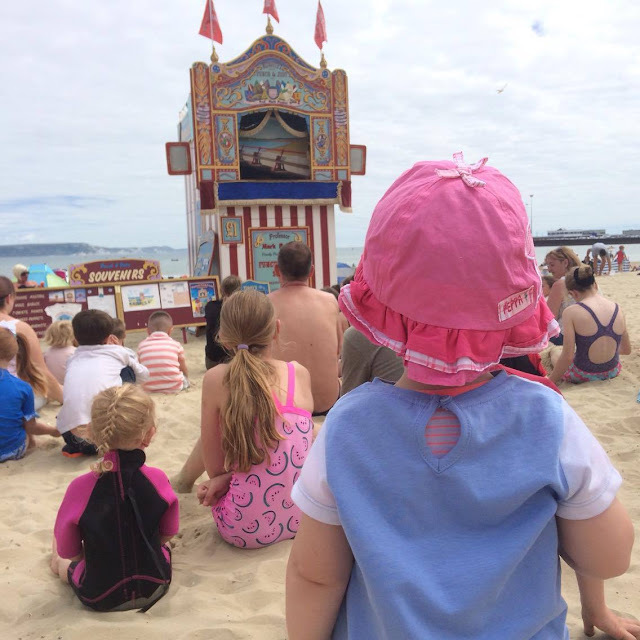 The punch and judy stand has been there for years and although the storyline has slightly changed it still has most the story and has punch trying to hit the crocodile. Later that day we went to a little pebble beach just off the harbour. Its my favourite as its a sun trap and so lovely and warm and the perfect place to dip your feet into the water. I really enjoyed doing this but Lily really didn't want to get her feet wet. 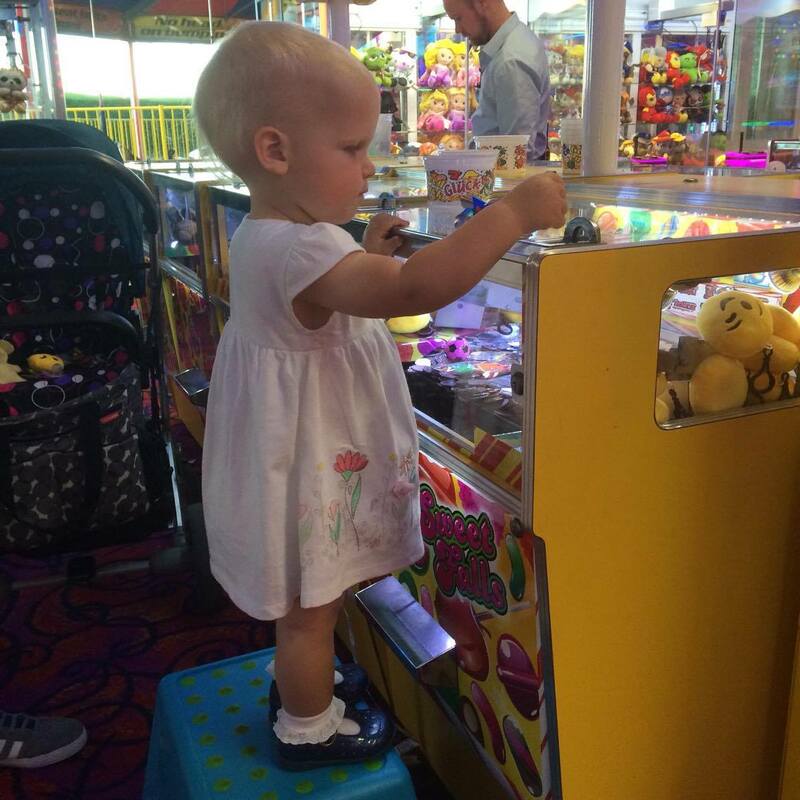 That night we took Lily to the arcades, she loved putting the 2p's in the machine. Then we took to her a bar that allows children, she really loved dancing and clapping along to the live acts. Monday we had a great day, not only was the weather really holding out for us and we had brilliant sunshine all day. We decided to do our usual long walk we do this day. We walk from the harbour where we are staying to somewhere called Bowleaze Cove. The walk can take a hour or so walking fast but this day we were having a slow stroll and letting Lily walk to. Its one of my favourite things to do when we go to weymouth and its a lovely walk with beautiful views over the sea. We stopped half way for lunch in a cafe called Jurassic Rock Cafe, they do lovely food and the view from it are amazing. When we got to Bowleaze cove we made it in time for the carboot sale that happens every monday and I picked a few goodies up. Then we went to the pebble beach there and Lily really enjoyed throwing rocks into the sea. After we walked it all the way back, we went to a little play cafe we had found. It was amazing for parents and children. We could all relax and have a drink and Lily had a indoor area with play kitchen and toys in, and a outdoor one with playhouses and slides. It was only £1 for Lily to go and play and so worth the money. This day we decided to take a drive over to a place called Lulworth Cove. Lulworth is such a beautiful place with a little village which leads down to the cove and the sea. This day Lily wasn't in a great mood. Very tired and wasn't in the mood for much else other than laying in her pram. She was tired and I think the heat had got to her. Me and my partner left her with my parents for a bit and went off climbing up a path up a hill. There you can see beautiful views of weymouth and portland and there is also a view of some jurassic rocks that have little arches and caves in. Me and Chris decided to take a walk down to the arched rocks and dip our feet in the water. The water by the rocks look so clear. 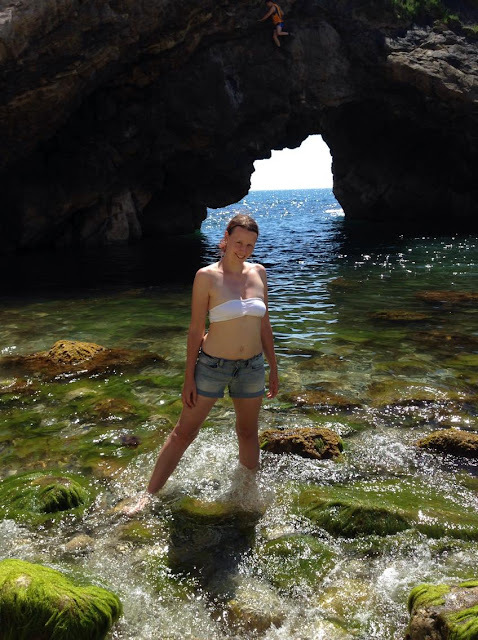 It was really lovely and I could of happily of gone swimming in it that day. 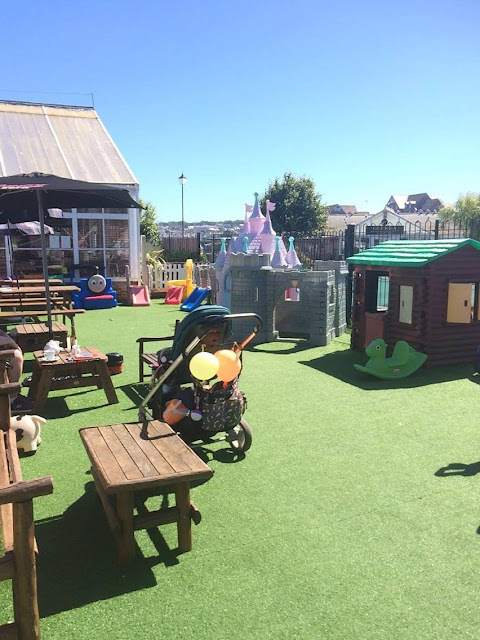 My mum wasn't feeling to well this day, So I decided to take Lily back to the play cafe for the morning to let my mum have some chill out time. Lily loves paying with my mum and so doesn't give her much relax time. Lily had a 2 hour nap this day which I was so glad off so then she would enjoy the afternoon. 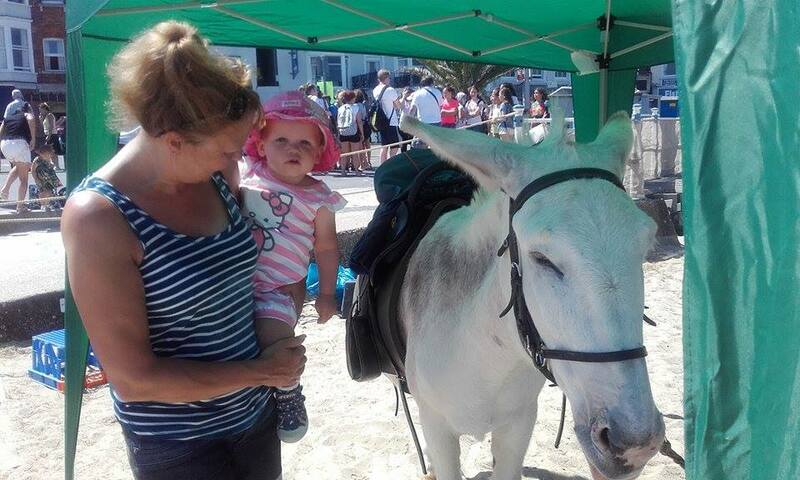 She definetly did that, we went to see the donkeys on the beach which she loved stroking with my mum and then we headed down to the wet sand so Lily could build sandcastles. I went in the sea again but Lily wouldn't come in. 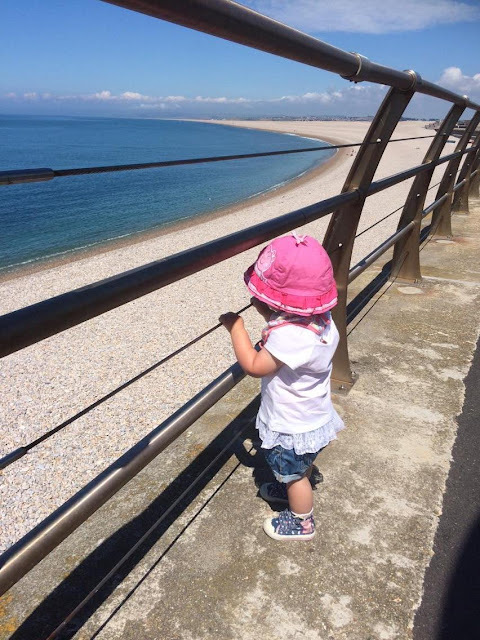 It was really strange as she was stood at the edge of the water crying and shouting mummy mummy mummy, even though my mum was with her. It was almost like she didn't like me being in there. We had a great day on Thursday. We went to Monkey World. I have been to monkey world many time and always enjoy it. Lily loved seeing the monkeys, though was a little monkey herself running around and trying to climb on things. 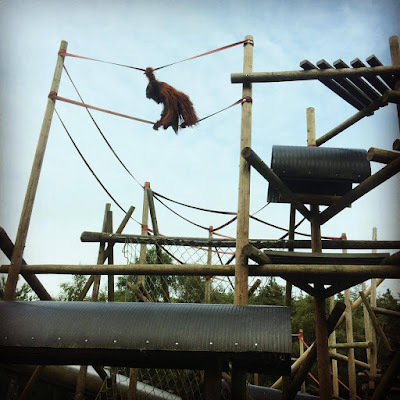 I am going to be writing a blog post about monkey world and so keep your eyes out for that. 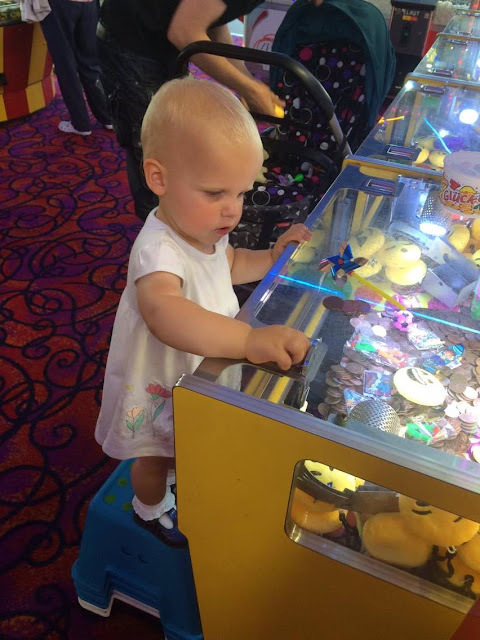 Later that night I took Lily back to the arcades, she got even better at the 2pm machines and was liking the machines and rides that lit up. We headed back to the bar and again she enjoyed the music and this night the soft play area was open so she had a good play inside there. Our last full day in Weymouth. We defiantly made the most of it. 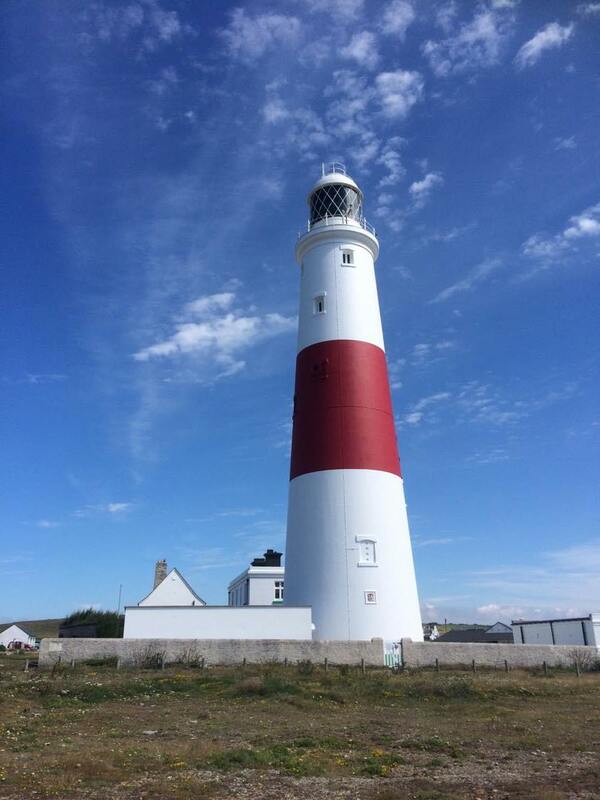 In the morning we headed up to Portland Bill to see the light house. Though Lily missed seeing it as she was napping. But me and my dad enjoyed a very nice walk on which was the nicest weather I had seen in Portland for years of visiting. Its also so silent there, all you can hear is the sea. Its so peaceful. After that we went to Chessil beach, had a lovely lunch in the cafe and then went on the beach its self. Lily really enjoyed this day, she was throwing all the big rocks and watching them bash into the other rocks. She again wasn't to happy to see me go into the water though and again was shouting mummy mummy, even though she was in her daddy's arms. It was a very very chilled out day. The day we had to leave. Im always so sad on this day. I hate leaving Weymouth behind. Its like a second home to me. I look back on the amazing week we have had and its gone so fast! To fast! Saturday was the day we always head to the shops and buy a few gifts. 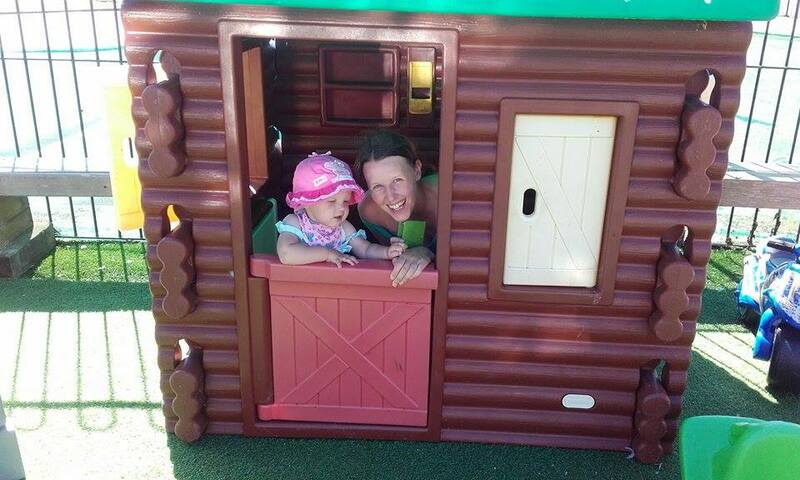 I also took Lily to the Toy shop for a end of the holiday treat and picked her up a Peppa Pig toy. I must say, it was the worst day of the holiday, simply because we had to go home. Always makes it ten times harder too, that I'm also saying bye to my parents who are heading back up north. So that, in short, was my holiday. 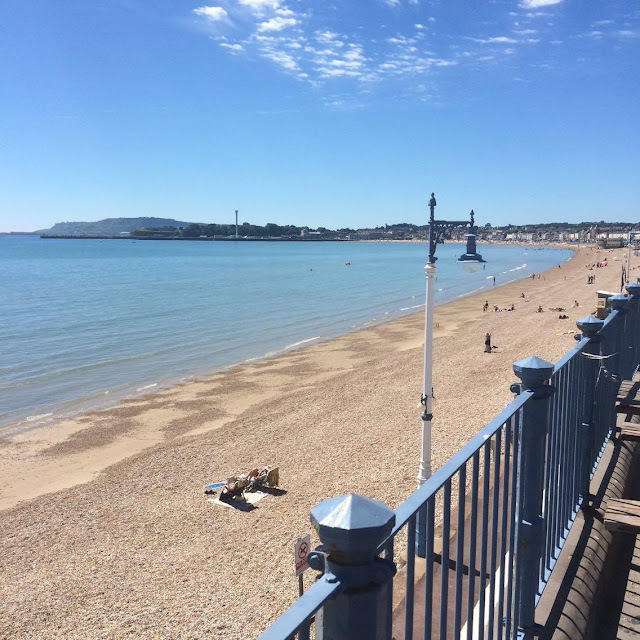 Have you ever been to weymouth??? If you haven't I would encourage you to give it a go one year. 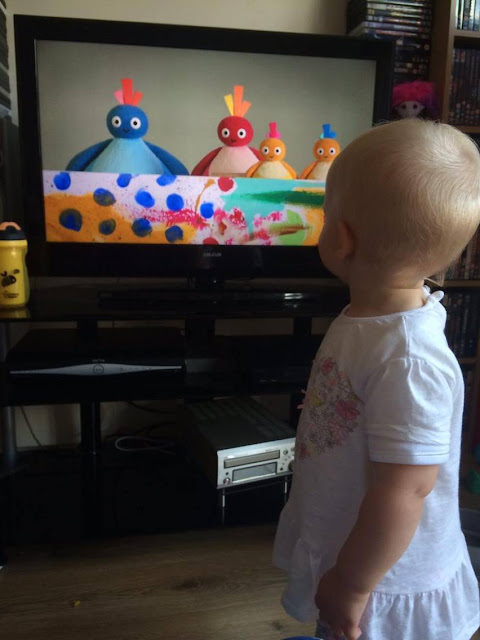 Its brilliant for families and children. 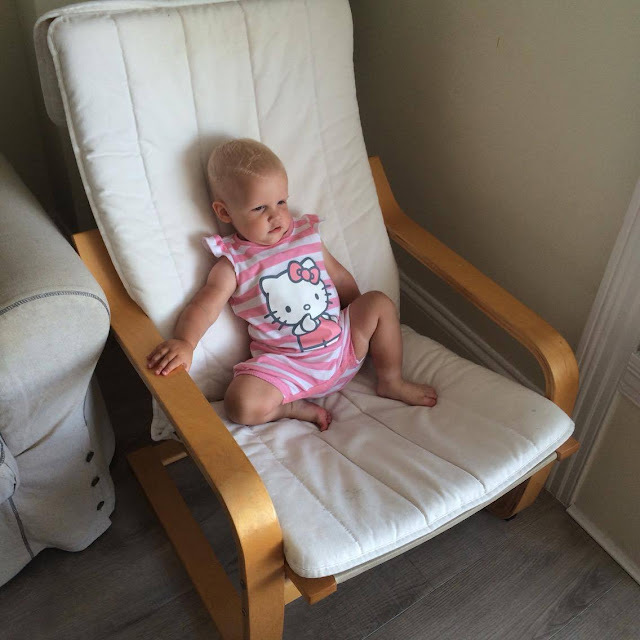 Lily has never really been ill. She had some sniffles when she was a few weeks old but apart from that nothing. 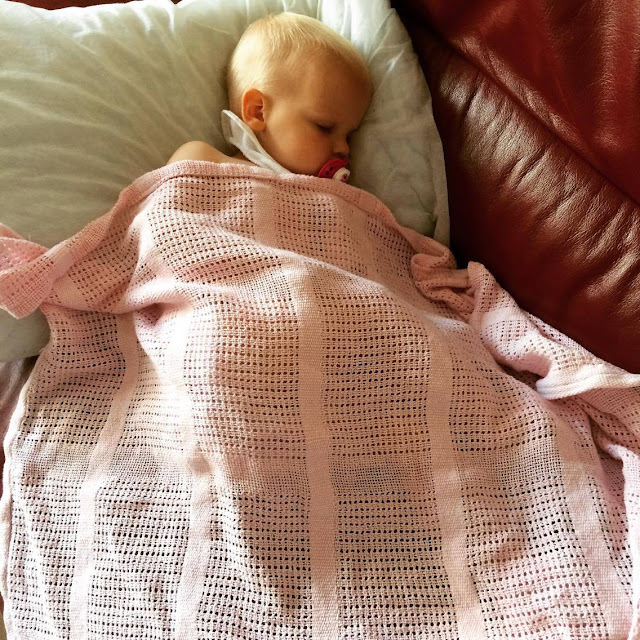 We have just got back from holiday and Lily is now ill. 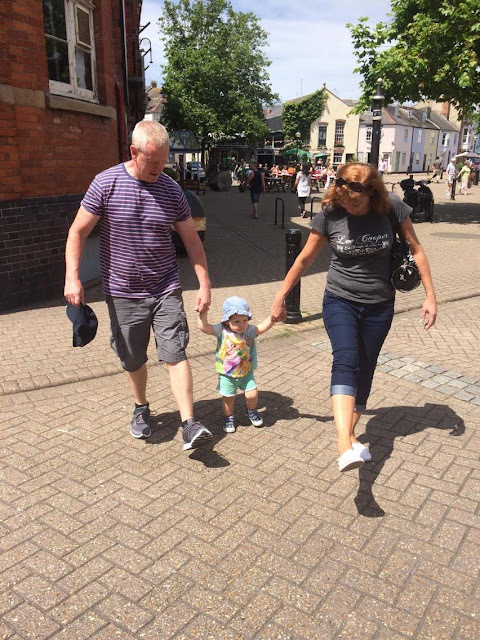 I was in the middle (and still am in the middle) of writing you a post all about my holiday but I've had to spend the last coupe of days dedicating all my time to caring for Lily. May be a weird thing to write about on the blog. But I want to record the first time she is poorly so I can look back and think, wow you didn't get poorly until you were 20 months old. It all started last Friday night while we were still on holiday. Lily went to bed very early and woke up around midnight with a high temperature and crying. A quick cuddle and she was fast asleep in my arms in bed and so I didn't fuss trying to get Calpol into her. Just let her sleep in my bed with me. Around 5am I woke up and felt her and she was so hot. She was fast asleep so I decided to try and get her back into her own cot so she would be cooler. On doing this she then woke up and started to cry and then coughed and was sick everywhere. I had never seen her be so sick before and so me and my partner took her into the bathroom to clean her up and wipe her down. My partner then took her to sleep in the living room with him where it was cooler and we could open the windows. The next day she wasn't much herself, very clingy and sleepy and wanting cuddles, though perked up enough for a trip to the toy store for the last hour before we set off home. The train journey wasn't to bad and she had a nice sleep on it. Saturday night Lily managed to get a decent night sleep and I was hoping that it would help her feel better. Sunday daytime it seemed like she was. She had a very runny nose but apart from that she went to the park and was running around. It was sunday night when things turned back to worse again she would not sleep in her own bed when we tried at 8pm and just wanted to be cuddled. She was hot and her nose all stuffy and a croaky throat. She also refused to take Calpol and I didn't really want to force it down her. So I just took her into my own bed and put on a film and after her rolling around for ages trying to get comfy she finally fell asleep. Sunday night was a hard one. She would constantly wake up and just cry and cry. Lily has always been easy to settle but not this night and Ive never heard her cry so much. Not even cuddles were working. The only thing that helped was plenty of milk and a bottle of that would send her back off to sleep. The next day she wouldn't eat and just spent the morning cuddled on the sofa with me. Which is not like her at all. All I could get her to eat yesterday was some chocolate and some cereal and then later she ate a small amount of rice. Better than nothing right? As long as she was drinking water and milk then I was happy that she was getting something. I think Lily is finally on the mend now. She spend last night in my bed again but slept a lot better with no tears. She is still very snotty and I keep feeling little wet fingers grab hold of my leg which I know full well is a handful of snot. She is still not eating which worries me a little, but she is currently napping and so when she wakes Im hoping she will want some food. Fingers crossed she will be better soon. Here is my second post for painting with household objects. 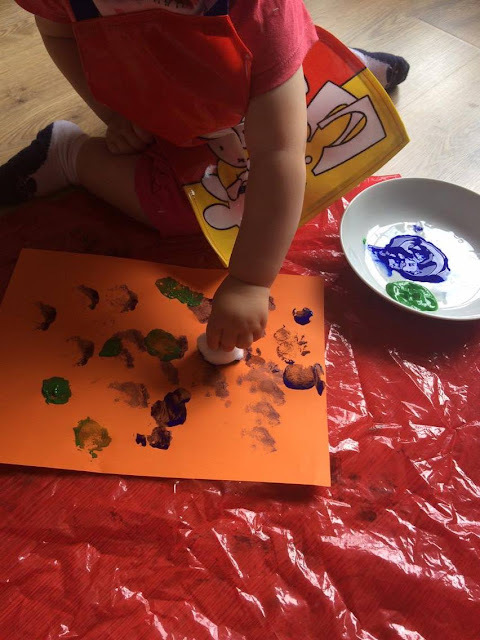 I think its great that sometimes you can look around your house and find something that can make a different pattern or mark on paper and so this week we decided to give painting with Cotton Wool a try. 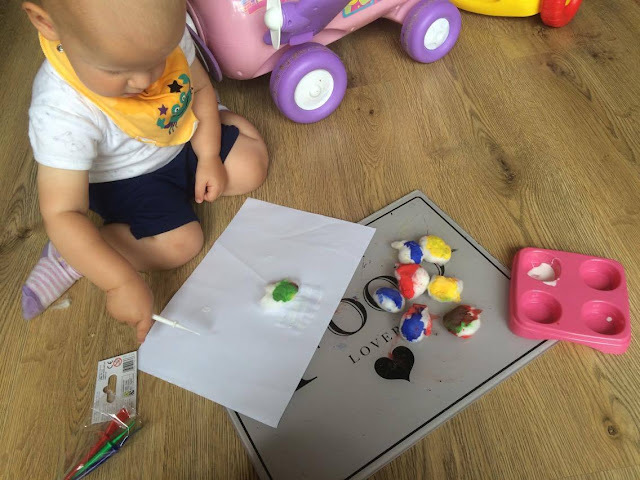 We always have cotton wool in the house ever since Lily was born but we rarely use it so I thought I would see what marks they would make. All you need is coloured card or plain card, coloured paint of your choice and cotton wool balls. 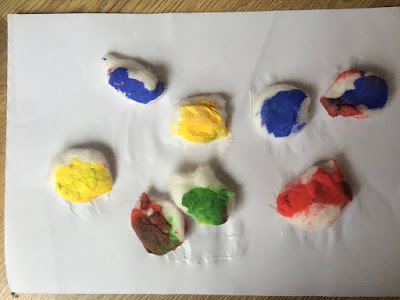 Lily really enjoyed this activity and soon learnt that to get the best results you had to dab the cotton wool onto the paper. It made a really nice circular print and the more she dabbed it onto the paper the patterns changed with having less paint on. 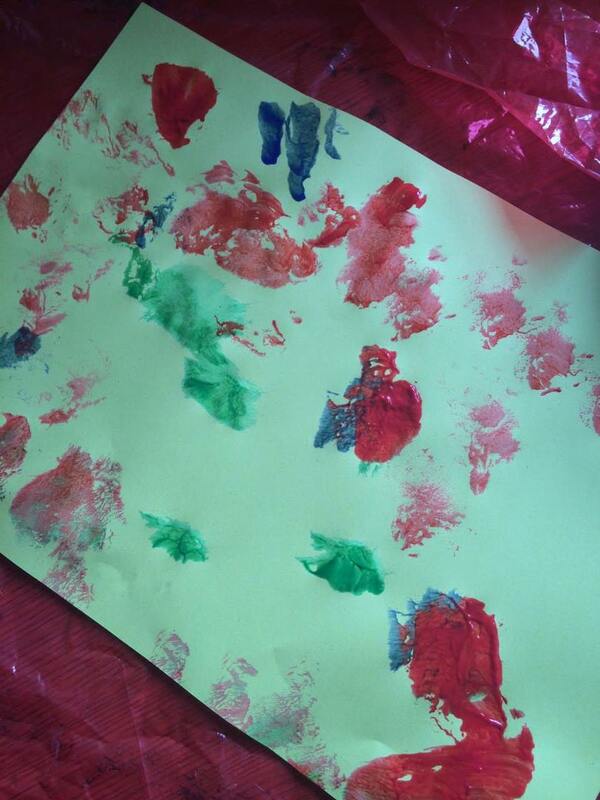 I think it looked great and it was a really easy thing for Lily to paint with. Lily just dabbed hers on the page as she is only 19 months old. But for a older child you could make some really nice flower pictures with this effect. Here are the finished results. One more thing you can then do with the cotton balls is leave them to dry and then use them to stick with. Would be a waste to throw these colourful cotton balls away and sticking Lily really enjoys doing. Simply get your glue, and some paper and stick them down. I kept it simple for Lily with her age in mind. But for older children they could again be used as flowers, or anything the imagination brings. First thing I could think of is Mr Tumbles spotty bag! Here is Lily's finished Result. 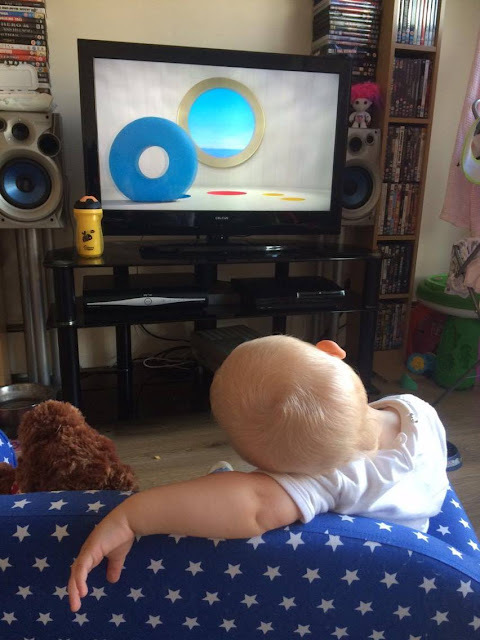 Not bad for a 19 month old. 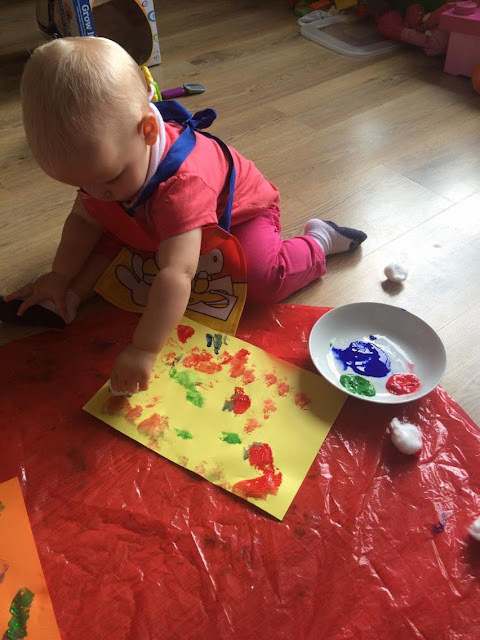 What Pictures would your children make? Its a Bing Thing - Win a My Friend Bing and Goodie Bag! Who has heard all about Bing's new baking app? Head to the home page and yesterdays post to read my review all about it. Its out now and you can head to your Apple app store to download it now. To celebrate, Team Bing are kindly giving away some amazing prizes and here is where you can enter to get your hands on them. 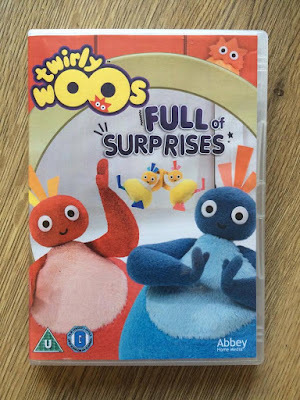 The amazing prize that is on offer is a My Friend Bing and Goodie bag which includes 3 plush toys and a activity book. My Friend Bing has lots of phrases and lots of realistic movements. He will tip toe around and play statue still, and run really fast and ooops he may also fall down. 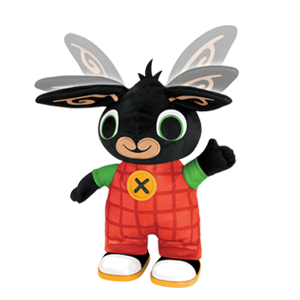 Your little Bingster is bound to love him. He retails at £39.99 and so it an amazing prize. 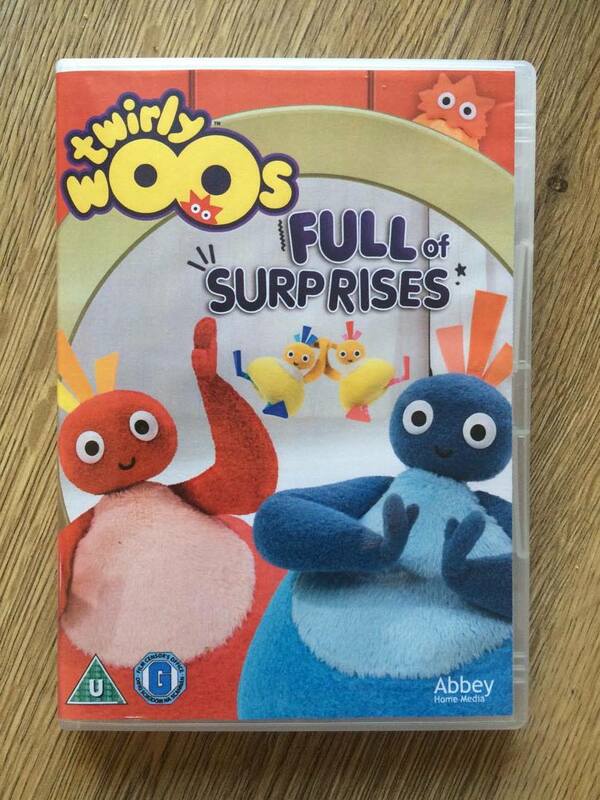 You can also buy your bing from many high street toy stores. 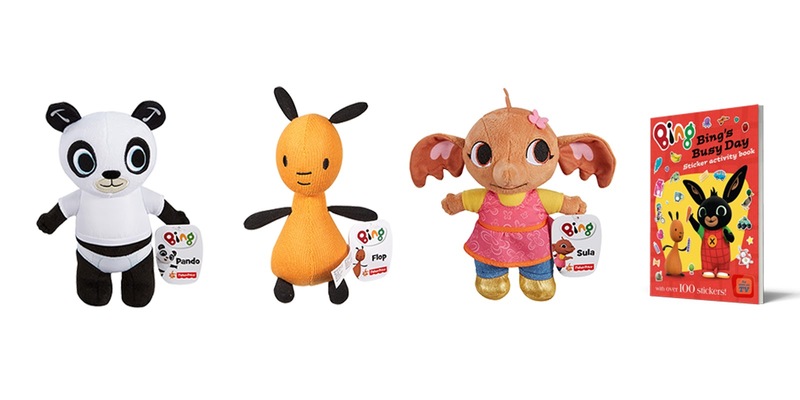 Your also bound to love the 3 plush toys that come in the goodie bag. As they are Bings wonderful friends, Flop, Zula and Pando. For a chance to win this wonderful prize. Enter on the Gleam app below. 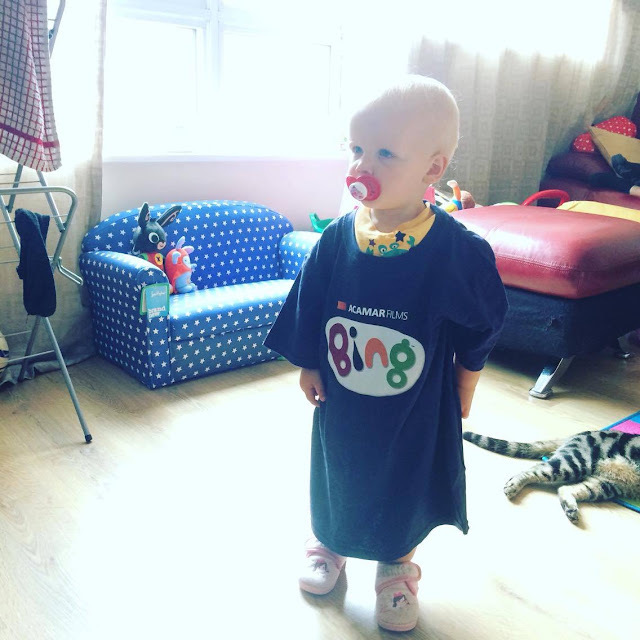 Don't forget to head to the Bing Facebook page and Twitter page to join in with lots of Bingster fun and activities. Its finally here! The thing we have all been so excited about. Yes.. even us adults. Its Bing's first ever app! Bing Baking. 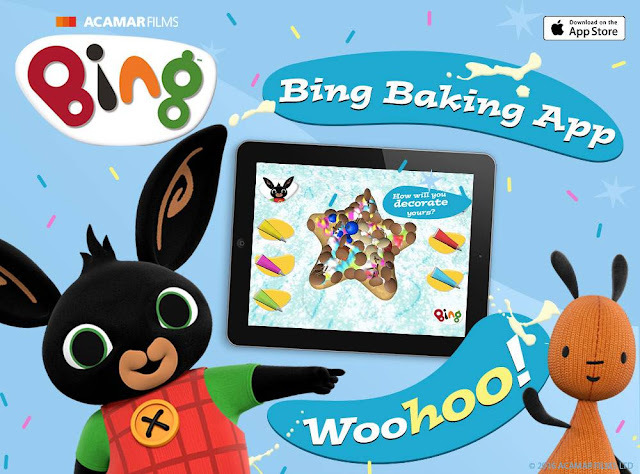 Baking - Its a Bing thing, and its now available to download from your apple app store. It will be out on Google play and amazon on the 11th of August. 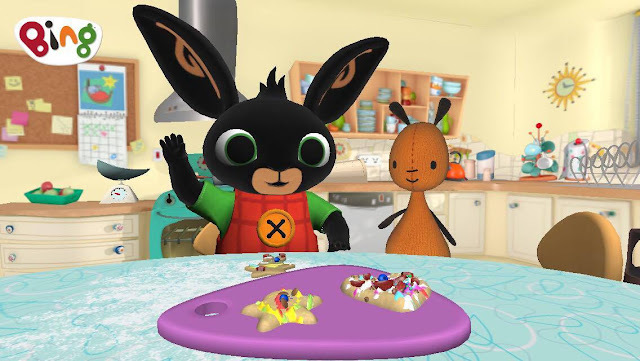 Bing Baking is a fun new app where you get to make your own biscuits in the kitchen with your best friend Bing and with of course help from the wonderful Flop. 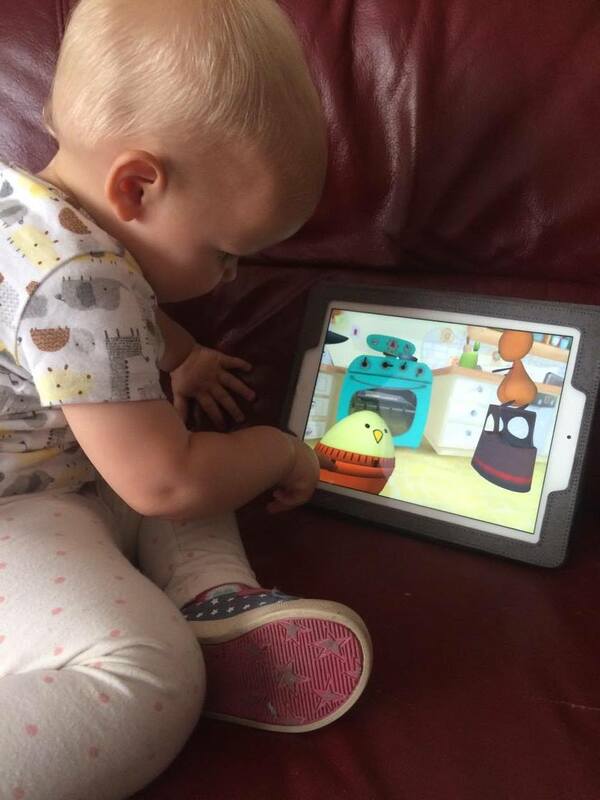 The app is a brilliant chance for your little bingster to get creative, colourful and messy as you get to roll, squidge, cut, bake and decorate your biscuits. 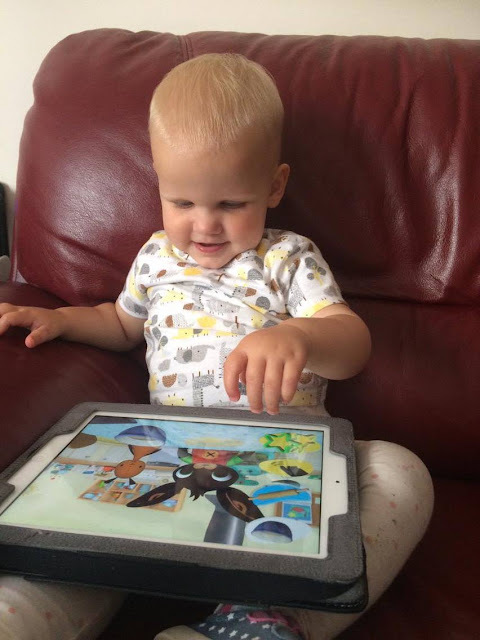 We were super excited that we getting to try out the app and I even made space on my iPad just so then Lily could have it downloaded it straight away. Lily is a huge Bing fan, and I must admit I have grown fond of that bunny myself. So I'm going to tell you all about this app. Simply because I love it so much that I think you need to know every little brilliant detail about it. As soon as the app loads up it introduces the game just like a episode of Bing only it mentions You in it. Which I think is a lovely little touch to invite you to the game. "Around the Corner, Not far away, Bing and You are baking today"
Lily was super excited to see Bing on my Ipad and Iphone. The quality of the graphics is so good its almost like you are watching an actual episode. Lily had a big smile that she was getting to almost interact with Bing by baking with him. 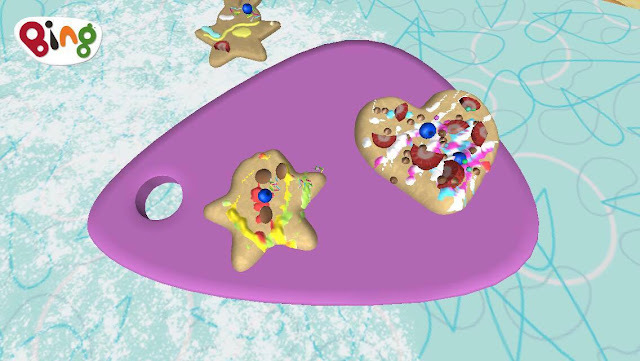 The game opens with a piece of dough and a rolling pin. You first need to roll out the dough by moving your finger back and forward in different direction. Lily is still quite young yet but she really enjoyed giving it a good try. I did have to help in the end. 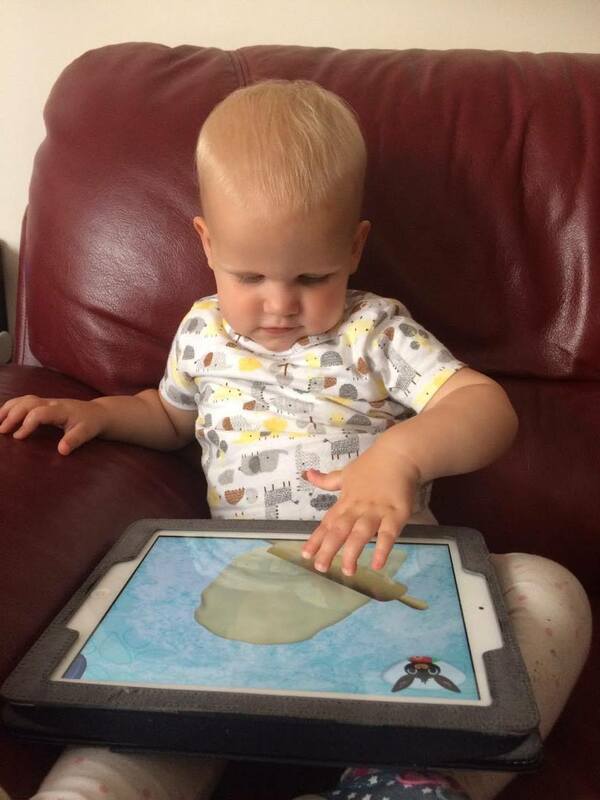 But for me I don't mind that as it just means that Lily is learning something new. For older children though, they should easily be able to master the rolling of the dough as its quite easy to do. You can also click the bowl button to add more dough. You can then click the squidgy button which allows you to prod at the dough and make holes in it if you like. I like this option because even though as adults we don't really stick our fingers in the dough, its a common thing that children LOVE to do, and its really nice that Team Bing have really thought about what kids enjoy when they are baking. Then its time to cut your dough. You have the choice of 6 different shapes to cut your biscuits into. You need to roll your dough out thin to be able to cut 2 shapes and if you don't then the app encourages you to roll more dough with a symbol and also flop explaining that the dough is to thick and you should try to roll it some more. Through out your baking experience Bing and Flop are talking to you. Encouraging you and you can also here bing talking about the baking to. The app keeps switching between the game and little video's where bing sings and talks. For example he tells you that the cutting with the shape is his favourite part. After you have cut your biscuit its time to bake them. After cutting 2 shapes, it automatically goes to a scene where they say its time to put them in the oven. Your next job is to hit the Chicky Timer when it beeps, overwise the biscuits burn. This is something I had to show Lily when to do as she didn't understand. Though even I forgot at times and accidentally got some burnt biscuits. If you do burn your biscuits, its okay, its no big thing! Just like the episode Called Watch Bake, you can still decorate your biscuits. You then have loads of decorating options where you can add chocolate, fruit, icing and sprinkles. Then these options have options, and you can choose different colours, and fruits and it even has Bing's Favourite. Carrots! 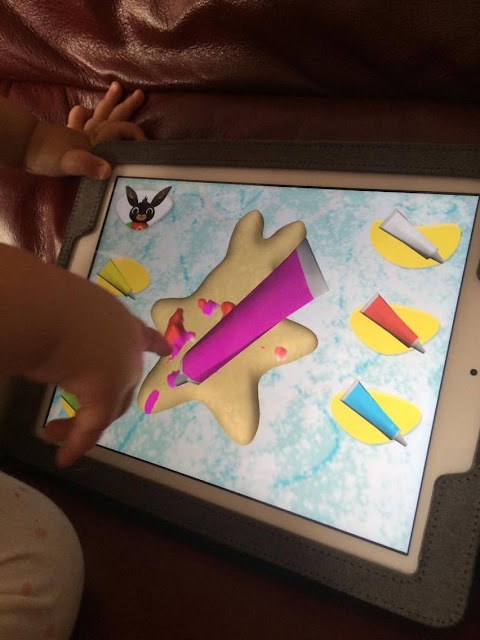 Lily found it quite easy to decorate her biscuits, she has played colouring apps before and so for her it was just the same motions of tapping the screen and moving her finger around. But her decorations yet are just like her drawings, a colourful creative random pattern. After decorating your biscuits you now have the chance to take a photograph of them, to record your wonderful and yummy creation. You just click the camera button and it takes a photograph. If you click the chopping board it zooms to a different angle so you can see it better. I didn't realise it did that, I just happened to stumble on it by tapping the screen. Here are some that Lily did. You can also eat your biscuits by clicking the little cookie symbol and it comes to the edge of the screen like you are really eating it. But as flop would say, Its No Big Thing, As you get to do it all over again and make some more. 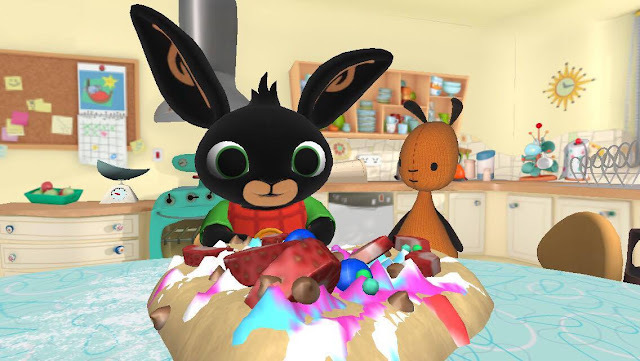 The Bing Baking app is £2.99 to buy which is so worth it just to see your little ones face light up when they realise they get to bake with bing. I can happily say that if Team Bing had not kindly sent me the app then I definetly would have downloaded and bought it. So, Get downloading, and if your waiting for it to still come out on your device, then head to the Bing Facebook and Twitter this week for some fun activities to keep you entertained until it does. Im off to bake some more biscuits.. Nom Nom Nom. Compatibility - Requires iOS 7.0 or later - iPhone, iPad, iPod Touch. Enter Below for a chance to win a free copy of the app!